One of my favorite library-related pastimes is browsing the cookbook section. In the past, I limited myself to checking out vegan cookbooks only —- but then I realized that I was doing myself a disservice. Now I’m happy to grab any cookbook that appeals to me, and Meera Sodha’s Made in India: Recipes from an Indian Family Kitchen appeals on many levels. First, it’s beautiful. The cloth-covered hard-bound cover bursts with color, including a sweet elephant illustration. Inside the book, the photos themselves are lovely and generous. Second, it was the runner-up in this year’s Food52 Piglet cookbook tournament, a wholly enjoyable competition wherein food writers, cookbook authors, and others review two cookbooks and select a winner, with that book advancing to the next round. Given how highly Made in India placed (and the words of enthusiasm bestowed upon it by its reviewers), I knew it merited at least a check-out from the library. 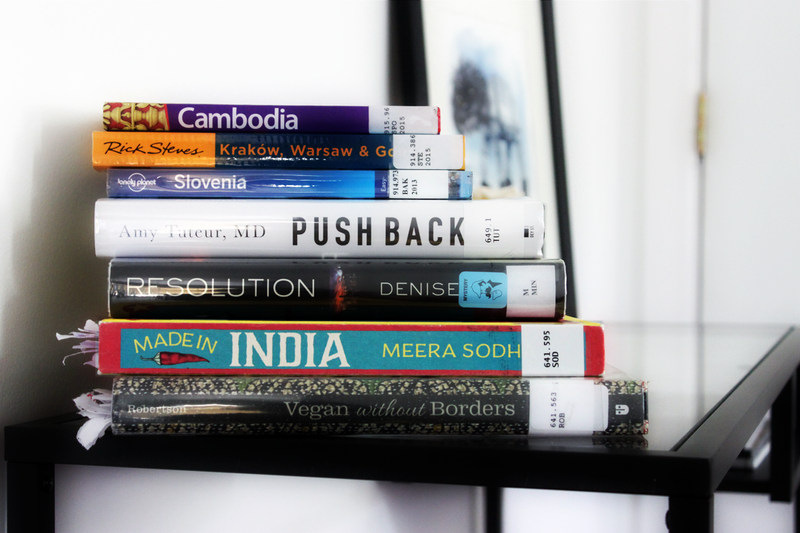 Made in India stands out in my stack of library books. What I found when I cracked open this book is an homage to home cooking, Indian-style. Sodha manages to make dishes you might’ve only ever eaten in restaurants seem utterly doable at home. I’ve renewed this book three times (the limit, alas), and I don’t want to give it back. It’s going on my Christmas list for sure. Yes, there are recipes for meat in here. But there are also veg-friendly recipes a-plenty, and the techniques Sodha shares can easily be applied to meat-free cooking. I do have a few vegan Indian food cookbooks already, but I think this one outshines them. I loved everything I made from this book. Badshah kitchari (p. 159). If you’re looking for a way to dress up your rice, this might just be the answer. Tender basmati and a few tablespoons of whatever dried lentils you have on hand meet cinnamon, garlic, onion, and a handful of other spices, and the result is a nuanced rice dish that just about stands on its own as a main. Bateta nu shaak (p.63). A testament to the transformative power of spices on relatively humble ingredients, this Gujarati potato and tomato curry is dead simple and tastes like much more than the sum of its parts. Green beans with mustard seeds and ginger (p. 181). I didn’t think this recipe would work. But when Sodha asks you to mix tomato paste into your green beans, just do it. Yes, it will look a little strange and you won’t be sure if it’s supposed to clump up like that. But the end result is a super-tasty spin on green beans and a great way to make them a much more filling side dish. Hot flaky paratha (p. 198). Truth be told, I’ve always been a little intimidated by Indian breads. But I decided to try making parathas because there’s no rise time and they seemed pretty straightforward. A soft dough is rolled out, dotted with canola oil and flour, folded, sprinkled with more oil and flour, folded again, then finally rolled into a long, irregular triangle before being cooked briefly on a hot skillet. The result is a rich, flaky bread you’ll want to use to scoop up all your curries. It took me a few tries to get the skillet heat and cooking time right, but once I did, these came together beautifully. Jyoti’s peanut soup (p. 169). If you’re thinking, “Hmm, isn’t peanut soup typically an African recipe?” then you’re right on the money. This recipe comes from a woman who was raised in Uganda, before Idi Amin banished that country’s Asians. Instead of using pre-made peanut butter, you’ll need to roughly grind roasted peanuts yourself, resulting in a thick, creamy, yet textured soup. Sodha’s voice. It’s friendly and welcoming, yet confident; it’s personal, yet not self-centered. She’s sharing her family recipes from a place of love and respect without straying into sappy sentiment, and it works so well. Her method for perfect basmati rice. Although I’ve never been one to bemoan rice cookery, my technique was not exactly failproof. Sodha introduced me to a no-fail method for basmati rice that I’ll use for years to come. The design. I already mentioned the beautiful cover, but the rest of the book is also infused with this colorful, charming aesthetic. From the bold illustrations that introduce each chapter to the just-styled-enough photos, this book pleases the eye in every way. The index. It’s not comprehensive. Sodha includes multiple recipes for eggplant, but check E in the index and “eggplant” isn’t even listed. Personally, I like to use an index to find inspiration when I have a particular ingredient on hand, but that’s not possible with this book. Ed. note: The indexer of this book reached out to me, and it sounds like there was something ‘lost in translation,’ as it were. The index published in the U.S. version of the book is the same version originally published in the U.K. version—meaning I should have looked for “aubergine” instead of “eggplant.” Typically books are re-indexed for a new country of publication, but it sounds like it didn’t happen in this case. So if you’re in the U.S., be sure to search using U.K.-friendly terms! The directions, on occasion. Some recipes could’ve used a little clarification. For example, I’d never made parathas before I attempted Sodha’s recipe and technique. And while I found it mostly easy to follow with solid results, the last paragraph included this line: “Check for any uncooked [dark] spots of dough, then take off the heat…” Okay, but what do I do if I find those dark spots? Cook the whole thing for longer, or maybe press down on the dark spot so it gets more targeted heat? Some expert advice would’ve been much appreciated. I had a similar issue with the green beans — I wasn’t sure what to do when I added the tomato paste; it didn’t blend into the beans easily and seemed a little out of place (though, as previously mentioned, it tasted great). More direct instruction would not have gone amiss. To sum up, I loved this book. It’s a joy to read through slowly and a joy to cook from, a perfect marriage for a cookbook. Made in India is a book that I would happily find space for in my home. If you’ve used this book, let me know what you think! Note: This post contains an affiliate link. If you purchase something through my link, it costs nothing extra for you, but I get a few pennies to help cover hosting costs. Sounds like a good book to have. We don’t have a specialty book of this type. Maybe it will show up on two Christmas list!